Is it possible to scale and cut costs with automated self-service without sacrificing “human touch” customer service? 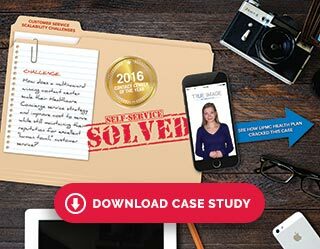 How does a multi-award winning contact center scale their Healthcare Concierge service strategy and improve cost to serve while still maintaining their reputation for excellent “human touch” customer service? As phase one of a comprehensive omni-channel self-serve automation strategy, we first implemented a Conversational IVR to handle approximately 580,000 telephone inquiries UPMC Health Plan receives annually related to lost ID cards and insurance eligibility. We built custom call flows, integrated with UPMC’s systems to personalize each caller’s experience, and provided a desktop “screen pop” when calls required live agent assistance, shortening call handling time and eliminating the need for members to repeat information. The project was completed in three short months and launched at the beginning of open enrollment in 2015. The results have been impressive: the Intelligent Virtual Assistant handles approximately 56% of in scope calls without requiring live agent assistance, saving 80%+ for calls managed fully by the IVA compared to the average cost per call of those managed by a live CSR. Phase two of the project will extend automation to the web through a visual human avatar “concierge” that uses artificial intelligence and natural language understanding to interact conversationally with users and deliver accurate, efficient responses.